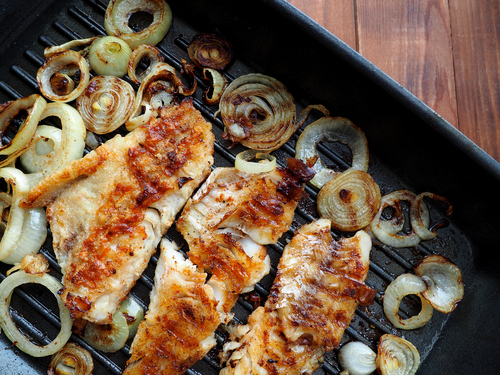 National Catfish Day is June 25, and there’s no better way to celebrate than to fry up some mouthwatering catfish dishes. This simple Cajun blackened catfish recipe takes just 50 minutes to prep and cook, and it’s so delicious your friends and family won’t believe it’s homemade. Preheat your RV oven to 350 degrees, and lightly grease a medium size baking dish. In a shallow, medium bowl, combine the cayenne pepper, salt, garlic powder and pepper. Brush the catfish fillets with butter on both sides. Rub them with the cayenne pepper mixture, so they’re coated thoroughly with the seasoning. Warm your large, heavy skillet on medium-high heat. Make sure the skillet is really hot before cooking the filets. Drop the fillets into the skillet and fry them for roughly 2 minutes on each side or until the outside of each filet is slightly blackened. Take the fillets out of the skillet and arrange them in your prepared baking dish in a single layer. Coat the fillets with the Italian salad dressing and bake them in the preheated oven for about 30 to 35 minutes. The filets should flake easily when tested with a fork. Remove your fillets from the oven and serve hot with your favorite summer sides. Celebrate National Catfish Day by catching fresh catfish at your favorite fishing spot. Fire up your RV this June and cruise throughout Pennsylvania to all of the awesome fishing holes our state has to offer. And don’t forget to stop and see us at Fretz RV in Souderton, Pa., for all of your summer RV sales, service and accessories needs.